Reproduced below is the text of British war journalist Philip Gibbs' report detailing the Canadians' success in seizing the heights forming the German stronghold of Vimy Ridge on 9 April 1917. As a consequence of the hard fighting experienced during the battle - and partly in public recognition of the Allied success - some four Victoria Crosses were awarded following the battle. Click here to read the official reaction of the Canadian War Records Office to the Canadians' success. Today, at dawn, our armies began a great battle, which, if Fate has any kindness for the world, may be the beginning of the last great battles of the war. Our troops attacked on a wide front between Lens and St. Quentin, including the Vimy Ridge, that great, grim hill which dominates the plain of Douai and the coalfields of Lens and the German positions around Arras. In spite of bad fortune in weather at the beginning of the day, so bad that there was no visibility for the airmen, and our men had to struggle forward in a heavy rainstorm, the first attacks have been successful, and the enemy has lost much ground, falling back in retreat to strong rearguard lines, where he is now fighting desperately. The line of our attack covers a front of some 12 miles southwards from Givenchy-en-Gohelle, and is a sledge-hammer blow, threatening to break the northern end of the Hindenburg line, already menaced round St. Quentin. As soon as the enemy was forced to retreat from the country east of Bapaume and Peronne, in order to escape a decisive blow on that line, he hurried up divisions and guns northwards to counter our attack there, while he prepared a new line of defence, known as the Wotan line, as the southern part of the Hindenburg line, which joins it, is known as the Siegfried position, after two great heroes of old German mythology. He hoped to escape there before our new attack was ready, but we have been too quick for him, and his own plans were frustrated. So today began another titanic conflict which the world will hold its breath to watch because of all that hangs upon it. I have seen the fury of this beginning, and all the sky on fire with it, the most tragic and frightful sight that men have ever seen, with an infernal splendour beyond words to tell. The bombardment which went before the infantry assault lasted for several days, and reached a great height yesterday, when, coming from the south, I saw it for the first time. Those of us who knew what would happen today, the beginning of another series of battles greater, perhaps, than the struggle of the Somme, found ourselves yesterday filled with a tense, restless emotion, and some of us smiled with a kind of tragic irony because it was Easter Sunday. In the little villages behind the battle lines the bells of the French churches were ringing gladly because the Lord had risen, and on the altar steps the priests were reciting the splendid old words of faith. "Resurrexi et adhuc tecum sum. Alleluia" ("I have arisen and I am with thee always. Alleluia"). The earth was glad yesterday. For the first time this year the sun had a touch of warmth in it, though patches of snow still stayed white under the shelter of the banks, and the sky was blue and the light glinted on wet tree-trunks and in the furrows of the new-ploughed earth. As I went up the road to the battle lines I passed a battalion of our men, the men who are fighting today, standing in hollow square with bowed heads while the chaplain conducted the Easter service. Easter Sunday, but no truce of God. I went to a field outside Arras and looked into the ruins of the cathedral city. The cathedral itself stood clear in the sunlight, with a deep black shadow where its roof and aisles had been. Beyond was a ragged pinnacle of stone, once the glorious Town Hall, and the French barracks and all the broken streets going out to the Cambrai road. It was hell in Arras, though Easter Sunday. The bombardment was now in full blast. It was a beautiful and devilish thing, and the beauty of it, and not the evil of it, put a spell upon one's senses. All our batteries, too many to count, were firing, and thousands of gun flashes were winking and blinking from hollows and hiding-places, and all their shells were rushing through the sky as though flocks of great birds were in flight, and all were bursting over the German positions with long flames which rent the darkness and waved sword-blades of quivering light along the ridges. The earth opened, and great pools of red fire gushed out. Star shells burst magnificently, pouring down golden rain. Mines exploded east and west of Arras and in the wide sweep from Vimy Ridge to Blangy southwards, and voluminous clouds, all bright with a glory of infernal fire, rolled up to the sky. The wind blew strongly across, beating back the noise of the guns, but the air was all filled with the deep roar and slamming knocks of the single heavies and the drum fire of the field guns. The hour for attack was 5.30. Officers were looking at their wrist watches as on a day in July last year. The earth lightened. A few minutes before 5.30 the guns almost ceased fire, so that there was a strange and solemn hush. We waited, and pulses beat faster than the second hands. "They're away," said a voice by my side. The bombardment broke out again with new and enormous effects of fire and sound. The enemy was shelling Arras heavily, and black shrapnel and high explosive came over from his lines, but our gunfire was twenty times as great. Around the whole sweep of his lines green lights rose. They were signals of distress, and his men were calling for help. It was dawn now, but clouded and storm-swept. A few airmen came out with the wind tearing at their wings, but could see nothing in the mist and driving rain. I went down to the outer ramparts of Arras. The suburb of Blangy seemed already in our hands. On the higher ground beyond our men were fighting forward. I saw two waves of infantry advancing against the enemy's trenches, preceded by our barrage of field guns. They went in a slow, leisurely way, not hurried, though the enemy's shrapnel was searching for them. "Grand fellows," said an officer lying next to me on the wet slope. "Oh, topping!" Fifteen minutes afterwards groups of men came back. They were British wounded and German prisoners. I met the first of these walking wounded afterwards. They were met on the roadside by medical officers, who patched them up there and then before they were taken to the field hospitals in ambulances. From these men, hit by shrapnel and machine-gun bullets, I heard the first news of progress. They were bloody and exhausted, but claimed success. "We did fine," said one of them. "We were through the fourth lines before I was knocked out." "Not many Germans in the first trenches," said another, "and no real trenches either after shelling. We had knocked their dug-outs out, and their dead were lying thick, and the living ones put their hands up." All the men agreed that their own casualties were not high, and mostly wounded. By three in the afternoon yesterday the Canadians had gained the whole of the ridge except a high strong post on the left, Hill 145, which was captured during the night. Our gunfire had helped them by breaking down all the wire, even round Heroes' Wood and Count's Wood, where it was very thick and strong. Thelus was wiped utterly off the map. This morning Canadian patrols pushed in a snowstorm through the Farbus Wood, and established outposts on the railway embankment. Some of the bravest work was done by the forward observing officers, who climbed to the top of Vimy Ridge as soon as it was captured, and through a sea of heavy barrage reported back to the artillery all the movements seen by them on the country below. In spite of the wild day, our flying men were riding the storm and signalling to the gunners who were rushing up their field guns. "Our 60-pounders," said a Canadian officer, "had the day of their lives." They found many targets. There were trains moving in Vimy village, and they hit them. There were troops massing on the sloping ground, and they were shattered. T here were guns and limbers on the move, and men and horses were killed. Beyond all the prisoners taken yesterday by the English, Scottish and Canadian troops, the enemy losses were frightful, and the scenes behind his lines must have been and still be hideous in slaughter and terror. 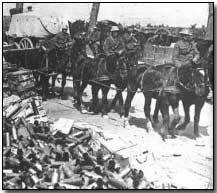 The Battle of Arras is the greatest victory we have yet gained in this war and a staggering blow to the enemy. He has lost already nearly 10,000 prisoners and more than half a hundred guns, and in dead and wounded his losses are great. He is in retreat south of the Vimy Ridge to defensive lines further back, and as he goes our guns are smashing him along the roads. It is a black day for the German armies and for the German women who do not know yet what it means to them. During last night the Canadians gained the last point, called Hill 145, on the Vimy Ridge, where the Germans held out in a pocket with machine guns, and this morning the whole of that high ridge, which dominates the plains to Douai, is in our hands, so that there is removed from our path the great barrier for which the French and ourselves have fought through bloody years. Yesterday, before daylight and afterwards, I saw this ridge of Vimy all on fire with the light of great gunfire. The enemy was there in strength, and his guns were answering ours with a heavy barrage of high explosives. This morning the scene was changed as by a miracle. Snow was falling, blown gustily across the battlefields and powdering the capes and helmets of our men as they rode or marched forward to the front. But presently sunlight broke through the storm-clouds and flooded all the countryside by Neuville-St. Vaast and Thelus and La Folie Farm up to the crest of the ridge where the Canadians had just fought their way with such high valour. Our batteries were firing from many hiding-places, revealed by the short, sharp flashes of light, but few answering shells came back, and the ridge itself, patched with snowdrifts, was as quiet as any hill of peace. It was astounding to think that not a single German stayed up there out of all the thousands who had held it yesterday, unless some poor wounded devils still cower in the great tunnels which pierce the hillside. 'Push' was slang signifying a large-scale attack upon enemy positions.